The majority of manga is drawn in the moé style that evolved from Dr. Osamu Tezuka’s original contributions which were influenced by Disney. I said Manga is crap. The only reason I said this is that Manga is crap. As David notes, however, "The general dismissal of manga's artistic merit isn't anything new, but the added doses of cynicism and condescension made it seem somehow special." True. I AM cynical and condescending to a special degree but I am uncomfortable with an entire genre of comics being dominated by a single "look" that, furthermore, relies heavily on a masked fixation with adolescence. Perhaps that's too psychological of me but, friends, it's gross. Brigid Alverson spotted another grumpy dismissal of manga at the bottom of this Agence France-Presse story about manga dominating French graphic novel sales ("there's a lot less subtlety, fewer facial expressions"). Even this cartoon Johanna posted makes reference to a "manga look" that attracts younger audiences. Even if we just limit ourselves to manga that's made its way to our shores, I can still think of too many ready counterexamples to the idea that all manga looks alike to take it seriously. Look at the work of Junji Ito, Yoshihiro Tatsumi, Takehiko Inoue, Naoki Urasawa, Minetaro Mochizuki, Hiroki Endo, Hiroaki Samura, Usamaru Furuya, and Iou Kuroda, to name the first few that come to mind. Heck, even the best-selling manga chart-toppers have styles that don't really resemble the cutesy "manga look" stereotype: Naruto, Death Note, and Bleach all feature artwork that wouldn't look out of place in superhero comics. Again, maybe I'm too immersed in manga to see how it would appear to a neophyte. Maybe those who aren't already familiar with manga always happen upon examples that reinforce their stereotypes about Japanese comics. But it does surprise me that there are still some comic bloggers — who I would expect to be more attuned to various aspects of comic book culture — who have yet to disabuse themselves of the notion that all manga looks the same. 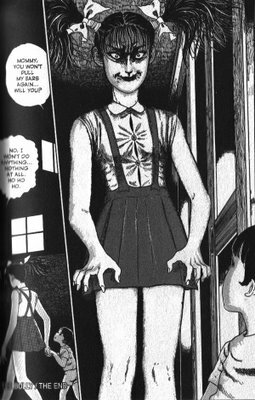 Creepy image of cutesy look gone wrong at top from Junji Ito's short story "The Bully," one of the eeriest pieces reprinted in Dark Horse Comics' Museum of Terror Volume 3, despite the fact that absolutely no supernatural elements are present in the story. "And We Totally Invented Superheroes, Too!"